The tremendous shock loads generated at launch by most any drag racing vehicle equipped with today’s sticky tire compounds or the acceleration and deceleration of oval track cars put considerable strain on the ring gear. For this reason, the fastener experts at ARP have developed the Pro Series ring gear bolts. They’re forged from premium grade 8740 chrome moly steel and are heat-treated to a nominal rating of 200,000 psi tensile strength. Specially hardened, precision-ground washers are included where required. Available to fit most any ring gear setup ranging from popular 9˝ Ford GM 10 & 12-bolt rear ends to the beefy Strange differentials found in Top Fuel and Funny Car applications. It is critically important to properly tighten ring gear bolts and make sure they don’t loosen. This is especially important in drag cars with tire shake. It’s also a good idea to check bolt tightness on a routine basis. If you use a locking compound (like Loc-Tite), it is best to install the ring gear first without any compound, then remove the bolts one at a time, reinstalling them with the compound. Be sure and torque each bolt before going on to the next one, because the Loc-Tite sets up fast. 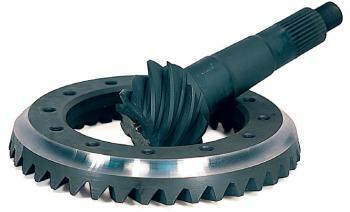 Install and torque the bolts in an alternating or crossing pattern to distribute the load evenly around the ring gear.